A woman with Multiple Sclerosis has sent a video message to county councillors to beg them not to make any more cuts to her care. Sandie Bailes from Dereham has already had five thousand pounds slashed from her budget even though her condition is worsening. County councillors in Norfolk vote on Monday on plans to make a further £111m of savings. 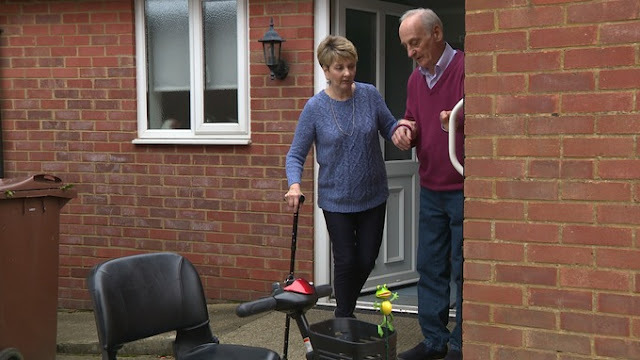 Charities say any more cuts to adult social care would hit the vulnerable. The council says it has to find savings somewhere. "I am worried that I will end up in a home because I'll be too depressed to bother and I'll just have to just wait and die." "We are making reductions to some people's personal care budgets, we are trying to do that in a way that really doesn't affect their care and doesn't affect their safety and fulfils our obligation, our statutory obligation to make sure their well being is safeguarded."